Yesterday (Nov 1st) was warm, granted. The activity by the hive was still surprising in its level and the fact they are still bringing in pollen. Now, I thought that the queen would stop laying so that pollen would become unnecessary in October. 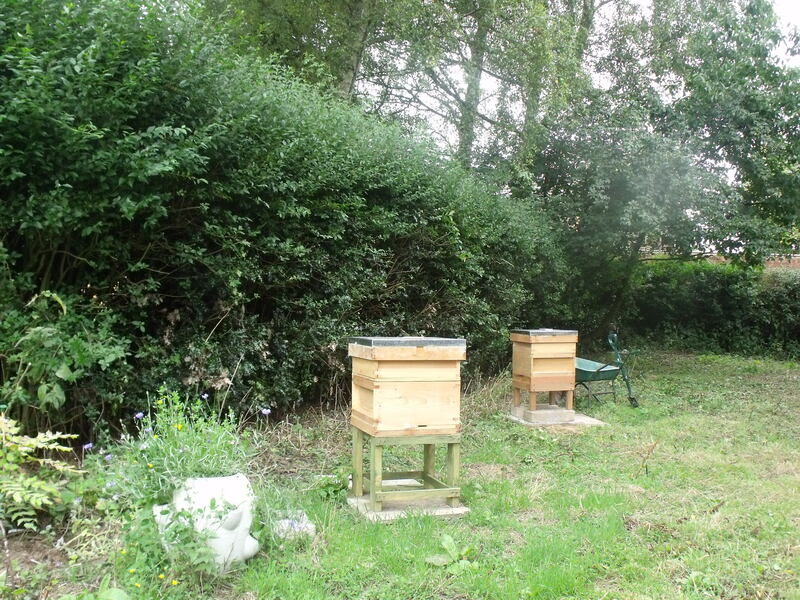 Are my bees unusually hardy – or just foolhardy? It is November 13th to-day. I had put the mouseguard in place a few days and wondered whether I should treat the wood before I added a netting jacket to deter woodpeckers. I had asked DH to get some clear cuprinol from Hildreth’s in Prestwood, sure they would have some. When DH came back empty handed saying there was none there I was rather stumped trying to think where would be most likely to have some. I didn’t want to order on line and have to wait nor did I want to have one trip after another. Not sure why I decided to go back to Hildreth’s – I suppose as it is close it seemed worth double checking as I would pass it without going out of my way. Within a few minutes of entering the garden section I had secured my purchase so I made a mental note not to trust DH on shopping errands again. It is disappointing when the outside of the hive starts getting that dull grey hue so perhaps this will stay looking nice for longer. If it is fine to-morrow it will be operation green woodpecker jacket. I’ll try it out on the empty hive first and I’ll then put the spare hive away for the winter – no point in exposing it to the weather needlessly. It’ll be good to try my plan out on a hive with no guard bees likely to take umbrage.